Rated: Fun for the whole family! Last week, I had the pleasure to attend a number of the films by the Hungarian master Béla Tarr, including his 450 minute epic Sátántangó. When friends asked me what I’d be doing that day, I explained to them I’d be at a seven and a half hour film. When that shot their ears up in horror, I went on: It’s all in Hungarian, and it’s in black and white, also not much happens in terms of plot, and it’s most likely about people suffering. When I told my friends after seeing it that I was truly inspired by the film, including the opening shot of cows wandering through an empty village, they questioned my authenticity. And certainly they are right to—who would sit through the work of Tarr? His aesthetic is uncompromising to say the least, and while most audiences have trouble approaching “art films” like The Descendants or even Malick’s The Tree of Life, Tarr belongs on a whole different playing field. But there is a brutal truth in Tarr (working once again with novelist László Krasznahorkai), coming at you in 24 frames per second (no digital here! 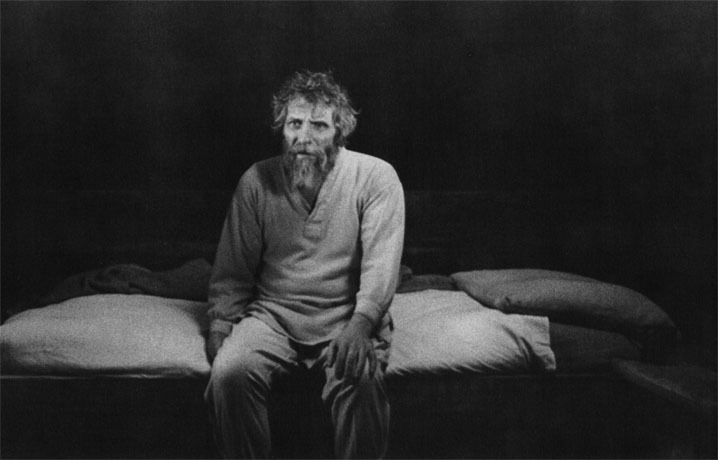 ), and one most apparent in his now final film, The Turin Horse. This deeply disturbing work borderlines on parody of art cinema, mainly because Tarr is a relentless filmmaker who never compromises in his portraiture of a life void of hope. Clocking in at just over two and a half hours, The Turin Horse is the most polished of Tarr’s films in terms of reaching a new height of minimalism, where everything to know about life comes in the small details the filmmaker slowly reveals. A mutual friend of mine, who is a close friend of Tarr, suggested to let the film “wash over me.” And bathe in despair I did. The titular horse of the film comes from the parable about Friedrich Nietzsche, who saw a horse being brutally beaten and broke down in tears, throwing his arms around the horse, and then refusing to speak for the last ten years of his life. A deadpan voiceover tells us that this film is about what happened to the horse. Really though, it’s about the man (János Derzsi) who whipped the horse, and his subservient daughter (Erika Bók, who played the young girl in Sátántangó). The two live in a home in a place more resembling hell than Italy. A brutal wind never stops howling as it attempts to crush the world around them, and the sky shines a constant gray that blinds anything past the first hill (the film’s black and white cinematography is gorgeously despairing, thanks to director of photography Fred Kelemen). For all they know, they own the last patch of dirt in the universe. Tarr thus uses his camera to capture the slow days in the life as man and daughter live their lives in this land of nothing. Tarr is only a collaborator in our own investigation to these lives and what meaning, if any, could be found here; he’s the type of filmmaker that never points with his camera. He allows you to investigate the frame as your eyes wander, looking for something that could be the answer. This is the type of film where the characters are defined by the way they eat boiled potatoes, after all. But jokes aside, the potato eating ritual is one of the crucial articulations of gender in Tarr’s world, between man, who smashes his potato and shoves it into his mouth with force, and woman, who gently eats potato, carefully savoring what little flavor can be found in each bite. And then there’s horse, a Bartelby-like figure who refuses to work, or even eat or drink. Why has the horse given up? Why is the man so stern about change? Why does the woman accept all that comes her way? Tarr’s film becomes an endlessly fascinating work that paints a psychological portrait of life fulfilled and unfulfilled, as the world becomes more punishing. This wouldn’t be as effective if his camerawork lacked its austere and masterful approach to long take. Despite running almost two and a half hours, The Turin Horse features only 27 shots, as the camera flows throughout scenes, often creating haunting compositions that reflect the character’s emotional realities as they struggle with daily life. These shots not only play out in real time, helping us enter the sense of endlessness and despair that seems to enrapture the world around the home, but bring us into an intimacy with the characters as they struggle to simply live. If the home seems to be the last refuge on Earth before the end of the world, Tarr’s camera flows vividly through what’s left of this world with all the wit of a Scorsese dolly shot and without a sense of any limitation. 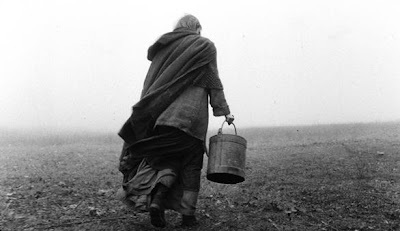 About halfway through The Turin Horse, a passerby visits the man and his daughter, delivering what seems like the only important dialogue of the film (there are moments here and there, but they seem almost inconsequential). He rants on and on about how change will never come to the world, and his nihilistic monologue seems to capture everything Tarr believes about life. The man, in what feels like a self-aware joke, simply responds, “That’s rubbish.” But is it? 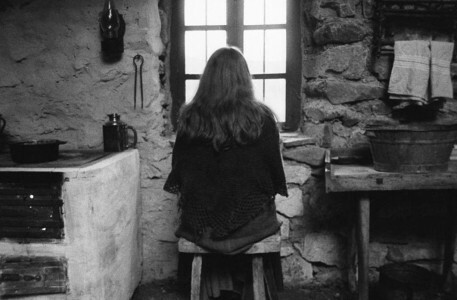 The Turin Horse is probably the most difficult film any person might sit through this year (at least those avoiding anything particularly avant-garde), and with its cinematic minimalism, as well as a it’s dreary and repetitive score, could cause many to flee their seats. I'm not sure it's Tarr's best film; there is something special about the furious anger in something like Damnation that may be less polished but more affecting. But sit carefully and give up on life, and submit to the power that is Tarr’s world. Nietzche couldn’t stand the pain of seeing an innocent creature submitted to the worst of violence, but Tarr finds this all but ordinary. Life is struggle, and can only end in despair and darkness. Live what you can.